Word .DOC Format. Exclusive Songwriter Agreement. Favors the publisher. View the sample file by clicking the 'Download' tab on the product detail page. Word .DOC Format. 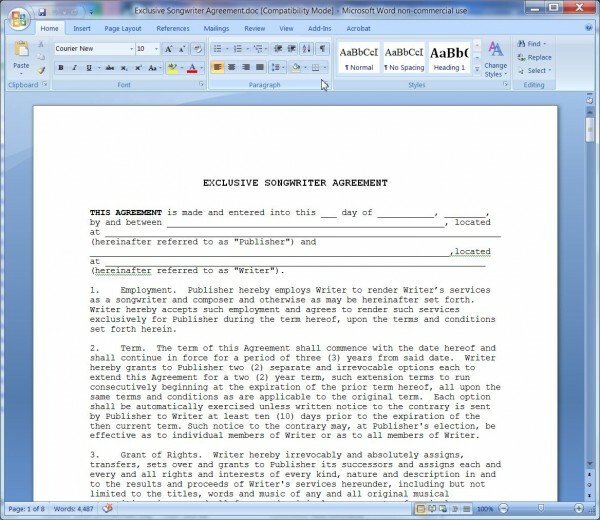 Exclusive Songwriter Agreement. Favors the publisher. The writer is secured to the publishing company as an exclusive writer for the term. Any works that are created remain the property of the publisher and do not revert to the writer. View the sample file by clicking the 'Download' tab on the product detail page. 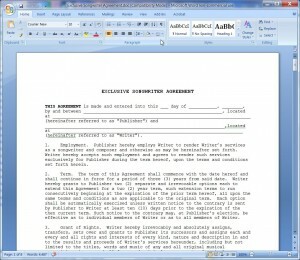 Exclusive Songwriter Agreement Favoring Publisher Sample in PDF Format.